Please see below the notification of our Annual General Meeting to be held post the Junior Presentation Ceremony on 7th April. Included are the details of committee positions and a nomination form for anyone seeking a position. The related constitution can be found here. As you may or may not be aware, at an AGM positions on the committee become vacant and we elect the office bearers of the club and members of the committee. To nominate for any of these roles please click on the button below for the nomination form. Nominations need to be returned to the club secretary on lindsayrchappell@gmail.com by Sunday 31st March. Nominations are made in writing, signed by the member nominating and the 2 supporting members of the club, and once received will be reviewed by the Executive Committee. Outlined below is the existing positions, those that people will or will not be standing again for, and those that we are actively seeking nominations for. We do hope that you might join us at the AGM, and encourage others to attend. We hope you have enjoyed the 2018/2019 season and will be part of making future seasons even greater. Registration is now open for the 2019 Sydney Metro Baseball League winter competition. Registration closes 1st March so please jump online and complete your player registration as soon as possible. · If it’s your first time registering, please create account, complete the required fields and select 2019 Winter Competition. 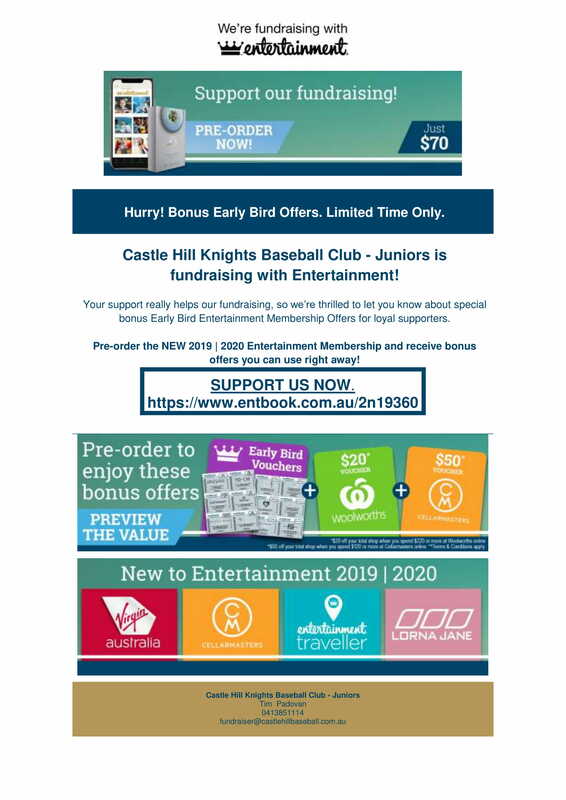 · On successful payment an email will be automatically sent from Baseball Australia and Castle Hill Baseball to confirm your registration. 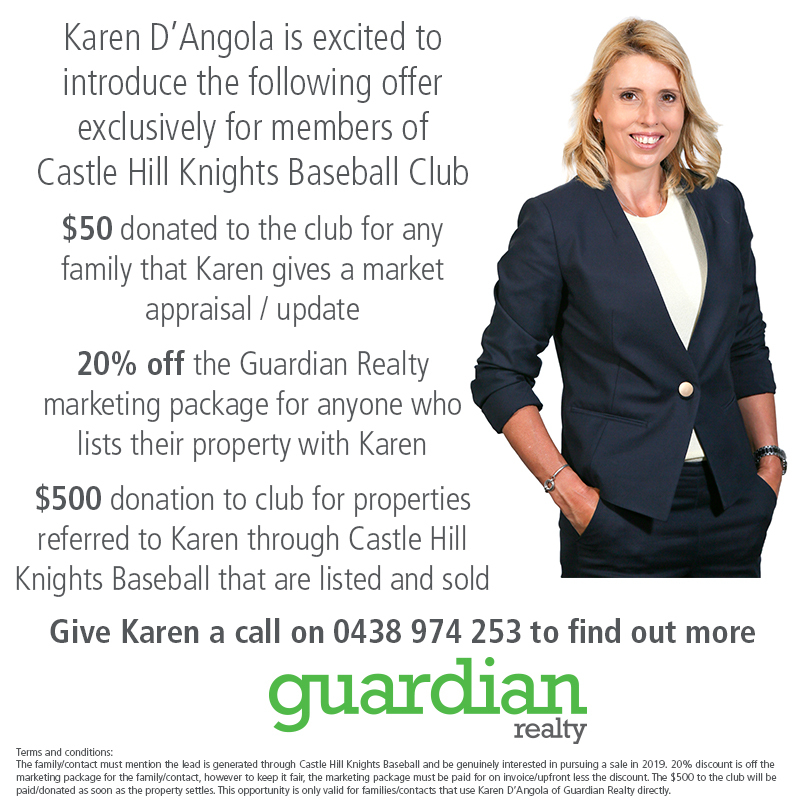 · If you don’t have a playing group already organised, email vpseniors@castlehillbaseball.com.au and I arrange introductions to our team managers. · If you have a team either returning from your previous Winter or Summer competitions, contact your team manager for more details. Mod Ball and T Ball games have until 27th February to be played by. There are redraws in some Competitions and changes to both grounds and times so please read the attached draw carefully. Rouse Hill move to their new ground at Caddies Creek Reserve this weekend. The ground is located in Millcroft Way, Beaumont Hills. 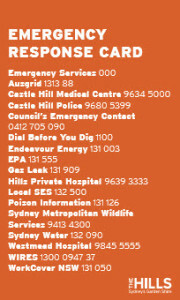 Access is off Windsor Road (turn right at lights, coming from Kellyville, @ Kellyville Pets). It is an approx. 500m walk from Carpark. You will be impressed at the look of the ground. Reminder that games washed out on 14th and 15th December have to be replayed by 12th February. If there are problems arranging these replays please contact me urgently. Akers League games do not need to be replayed.